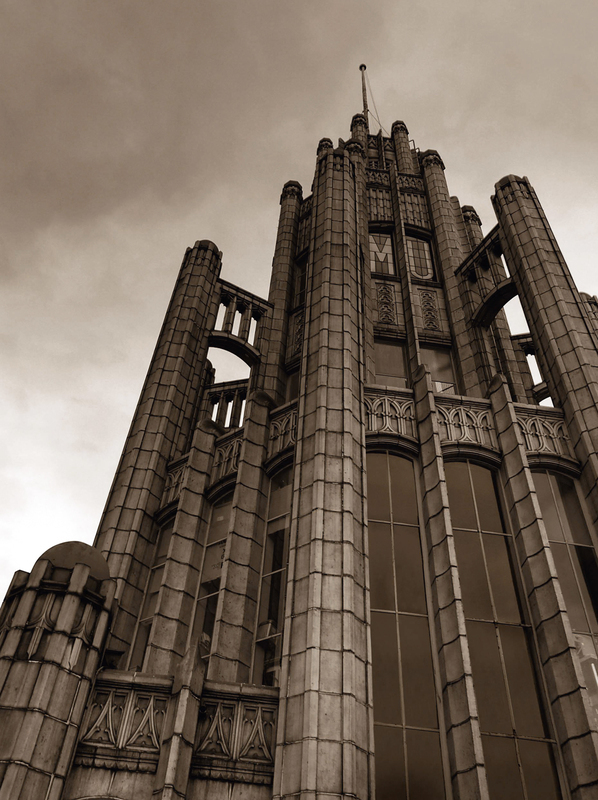 During its history to date, the Manchester Unity Building has been subject to major maintenance projects and has undergone several redevelopment phases. The first maintenance work took place in the 1960s, when the pointing of the faience tiles was starting to fail and needed to be replaced, an undertaking that attracted the attention of the press. Also replaced at this time was the worn 1930s linoleum flooring throughout the corridors. Just over a decade later, the building was listed on the Victorian Register of Historic Buildings, making it subject to numerous preservation constraints. Aware that substantial modernisation was in order, the MU IOOF commissioned a feasibility study to update the building within these restrictions, but the estimated cost of $2 million was considered prohibitive. The sale of the building in 1986 broke the record for auction sales with a price of $13.7 million, more than double the pre-existing record. A penthouse apartment on Levels 11 and 12 was planned as the Chias’ Melbourne home. 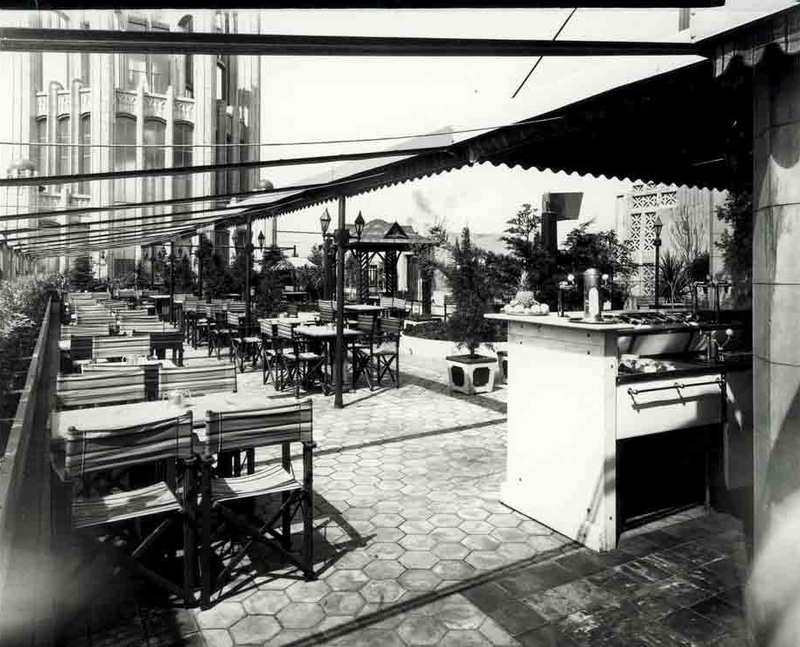 But Melburnians cherished the building’s original design and atmosphere, and newspapers reported on the unpopularity of the mooted transformation. As it happened, the plans fell into abeyance and the building, inside and out, fell into disrepair, eroded by damp, damage and general neglect. After the 1980s refurbishment the Melbourne City Council became one of the main tenants, occupying the whole of levels 10 and 11. The building is registered on the Victorian Heritage Database and the Historic Buildings Preservation Council and is classified by the National Trust. In September 1979, having decided against expensive refurbishment, the MU IOOF sold the building for $5.25 million to Sydney-based company Melbourne Gateway Pty Ltd, owned by Howard and Stella Chia. The Order retained the main lease for its offices. Three and a half years later, rumours of a $5.5 million restoration and modernisation began to circulate. Seven years later the Chias sold to Boris, Jack and Leon Liberman of Toorak for $13.7 million, more than double the city’s auction record to that date. The brothers spent millions on long-overdue renovations presided over by leading design firm Inter Arch. 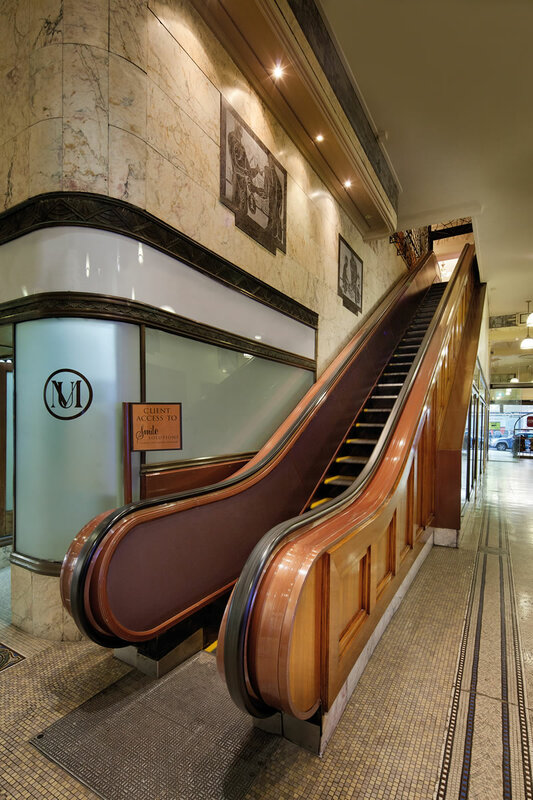 The damp was arrested, the carved ceiling friezes were either reinstated or restored, the timber panelling was re-polished, the wooden escalator to the mezzanine was replaced and a second new escalator was installed within Strandbags, the handbag and luggage shop facing the Swanston Street corner. 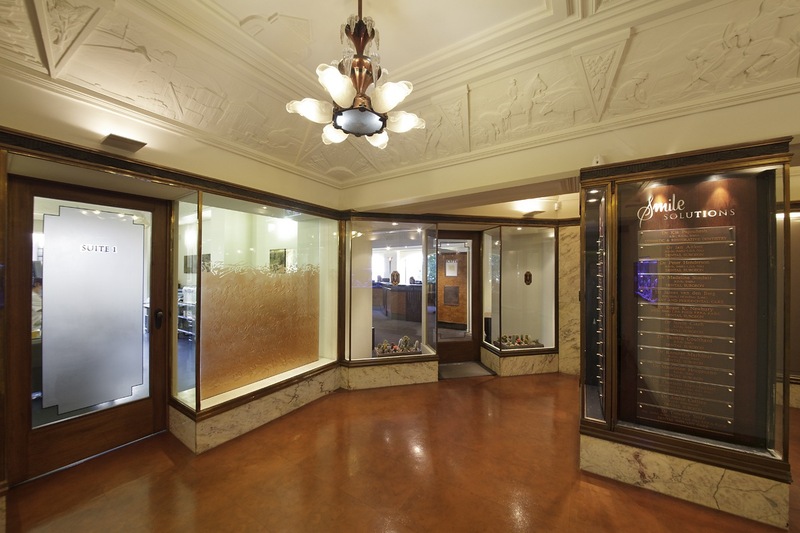 The marble murals in the arcade were cleaned and polished, obtrusive box air-conditioners were removed from external windows, and the interior of the building was rewired, re-plumbed and repainted. A sprinkler system was installed throughout. 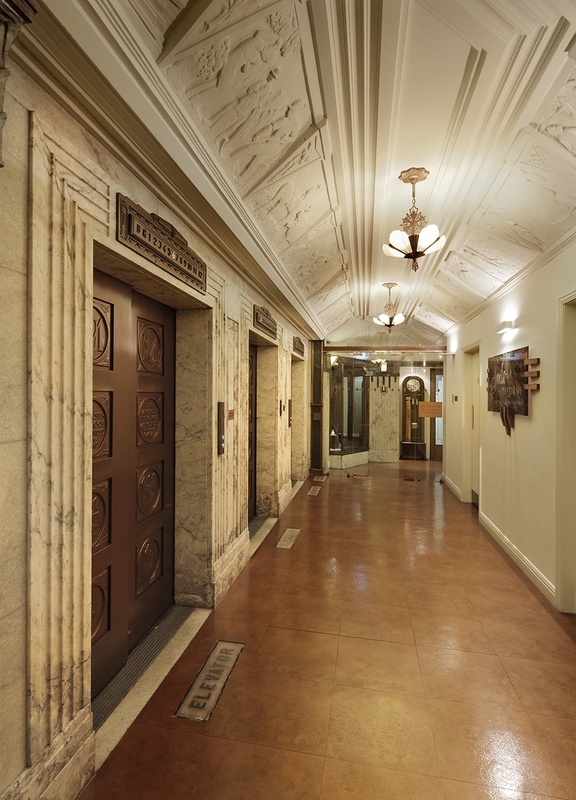 In the upper corridors, smoke doors were installed to separate the lift lobbies from the corridors, all tenancy signage was standardised, and mismatched modern doors to suites were replaced with specially made replicas of the originals. In 1996 the Manchester Unity Building was strata-titled. For the first time in its history, the building could be bought as individual lots at affordable prices. ‘Buy on your bank card’ spruiked the agent’s advertising. The majority of purchasers were existing jewellery and dental tenants, with a new breed of investors making up the balance. The lots sold quickly. Level 12 of the building was once a penthouse with access to the building’s gothic tower. A private developer bought three entire levels – 10, 11, 12 – and began to redevelop them as 12 residential apartments, including a rooftop penthouse with access to the tower. Many of the original internal features on these floors, including plaster cornices and the Level 11 timber-panelled offices of the MU IOOF, were removed. 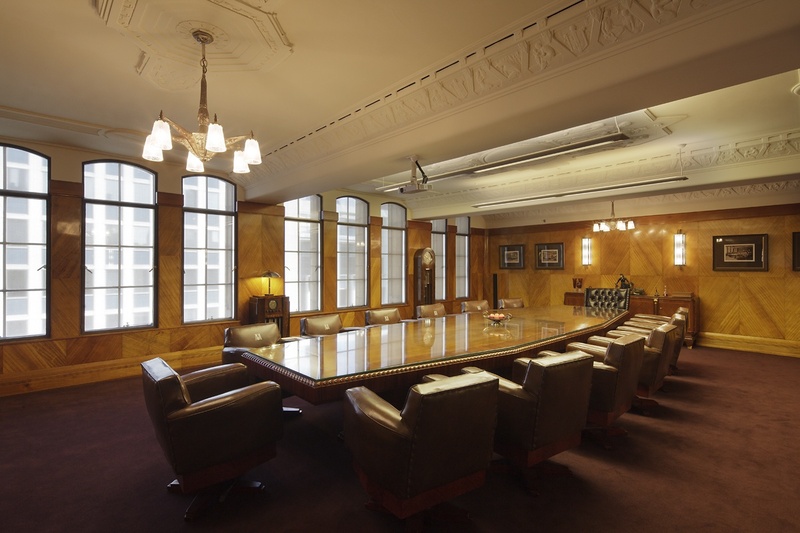 Thankfully, due to heritage protection, the boardroom with its original table and chairs was left unscathed. In 2003 dental practitioner Dr Kia Pajouhesh bought Level 1 of the building, which at that time comprised a number of shabby, vacant shops and the upstairs premises of the retailer Strandbags. 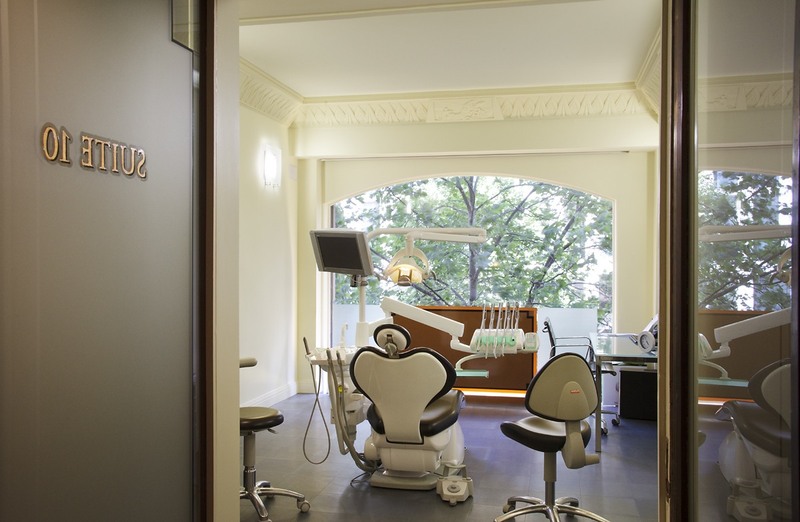 The 1986 escalator linking the ground floor to Strandbags’ first floor was promptly removed and refurbishment began as the dental practice Smile Solutions, the largest private dental practice in Australia. Many of the original features of the shopfronts were painstakingly reinstated or restored and the space was fitted out with state-of-the art dental technology and facilities. For more than a decade, the Committee of Management of the MUB Owners Corporation, under the chairmanship of Dr Kia Pajouhesh since 2003, has been actively engaged in a program of staged improvements to the building. Common-property upgrades have included lift doors and interiors, lift mechanisms, digital directory, waterproofing of the roof, and electrical rewiring. In the pipeline are repainting and relighting the corridors throughout Levels 2 to 9, and rejuvenation of the decorative awning. The committee is in the process of lobbying local, state and federal governments for funding to revitalise the building’s faience cladding. By 2012, the building’s retail spaces had become so sought after that the street-level shop occupying the Swanston–Collins streets corner was leased to Telstra at a rental that set an all-time record for the building. 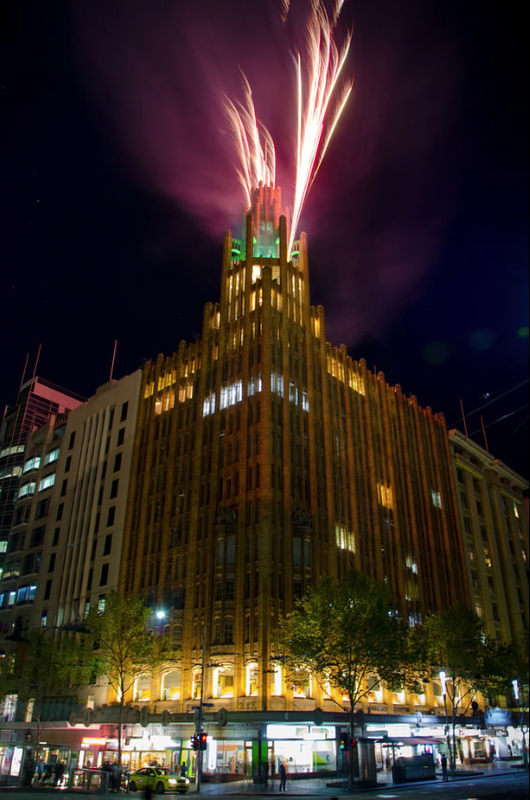 The eightieth birthday of the building was celebrated in September 2012 with then Premier Ted Baillieu relighting the tower and façade in a ceremonial re-enactment of the first lighting in 1932. The 2003 refurbishment of Level 1 alone spanned the same eight calendar months as the original construction of the entire building structure. In 2005 the Committee of Management of the Owners Corporation commissioned a comprehensive conservation management report from Allom Lovell conservation architects. The resulting document (click here) began to inform the committee’s efforts towards preserving and revitalising the building. 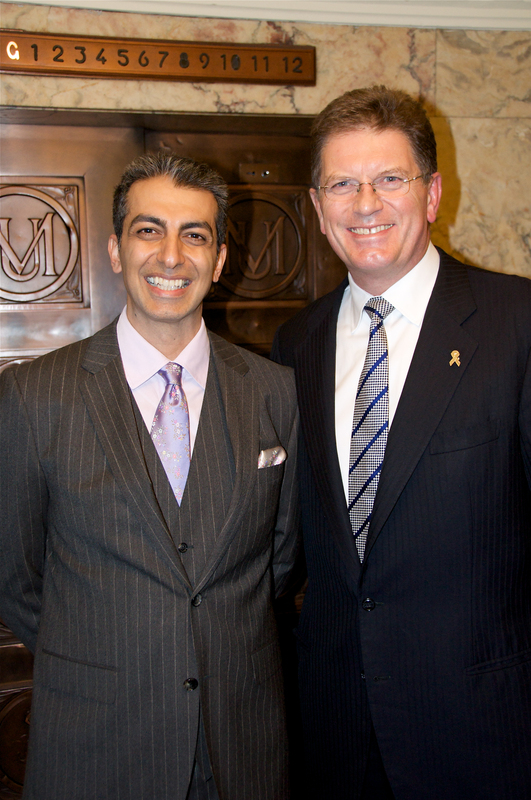 In 2006 Dr Pajouhesh bought the Level 12 penthouse and tower and restored the premises to commercial usage as the Collins Street Specialist Centre. Its areas of specialisation include paediatric dentistry. Coincidentally echoing a caricature drawn by architect Robin Boyd in 1962, it is said that the Tooth Fairy now lives in the tower, which doubles as an orthodontic centre. Meanwhile, in 2006 Dr Pajouhesh bought the Level 11 boardroom that had been redeveloped as an apartment in 1997. 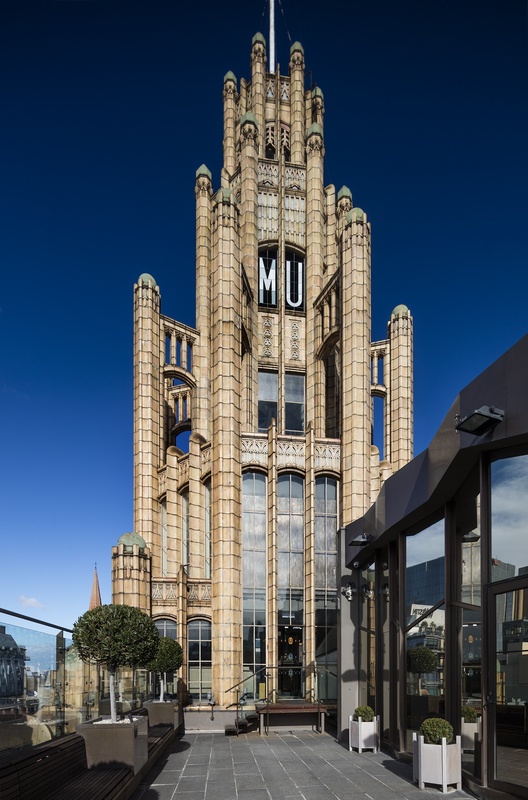 Several years later, showing the same flair, good judgment and meticulous attention to detail as the grand men of the MU IOOF, he began to restore the space to its original splendour under the guidance of Robert Mills Architects and Andronas Conservation Architecture. In the interim he had purchased two adjoining apartments and extended the refurbishment to house the corporate headquarters of his dental practice. Over 13 years Dr Kia Pajouhesh has worked with MUB Owners corporation to painstakingly restore the space to its original splendour.